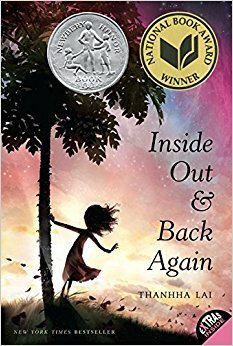 The process of writing the stage adaptation of Inside Out & Back Again has been a unique challenge for me as a playwright. Thanhha Lai's book uses a series of poems to tell the story of Hà and her family. In early discussions with Bay Area Children's Theatre, we decided Lai's poetry was so beautiful and vivid that we didn't feel it necessary to create new text for the stage version. All of the spoken words (with only a handful of exceptions) in the play are taken directly from Lai's text. My role in creating the play could be likened to that of an arranger of music, taking what already exists and re-organizing it to suit the needs of a play. In order to create my first draft, I typed the entirety of Lai's book word-for-word into a document I called "Source." When I decided which portions of Lai's text to include in the play, I would cut it from the "Source" document and paste it into my script document. I did this to keep track of which segments of the book I had already used, so as not to repeat myself in the script. I have cut, spliced, re-ordered, and re-contextualized the original poetry to try and create a version of the story that plays out well on-stage. Some slight word modifications have been made. Since I wanted to avoid the feel of an overly long monologue from Hà's perspective, portions of text have been given to other characters in the story. Things like pronouns and verb tenses had to be changed to accommodate these different voices. But for the most part, any new text that I do contribute to the story comes in the form of stage directions – describing setting, gestures, reactions, visual cues to help accentuate and potentially convey more than what words might allow. This method of building a script has had both its limitations and advantages. On one hand, sometimes I have wanted the poetry to provide words that it simply did not, and I've needed to find creative solutions to those problems by either re-contextualizing what is there, or by trying to go about it without words. On the other hand, I have not had the problem of typical "writer's block," where you must generate words yourself, but can't seem to find them. In this case, all the words are there, and it's up to me to place them where I need them. The result will hopefully be a piece that highlights Lai's beautiful poetry unpacked and opened up in a stage experience that will transport the audience along with Hà and her family. Posted on December 12, 2017 by Min Kahng and filed under Adaptation, Creative, Performing Arts, Poetry, Story, Writing and tagged Thanhha Lai Inside Out and Back Again Vietnam War poetry.